Get affordable guaranteed universal life insurance quotes instantly and compare online. No lapse universal life insurance offers a lifetime death benefit and a minimum guaranteed interest rate. Monthly premiums are higher than term life insurance policies and can have confusing policy options. Get guaranteed universal life insurance quotes and comparison online. Only basic personal information is needed to get gul insurance rates online. So, What Is Guaranteed Universal Life Insurance? As we like to say, "In Plain English," guaranteed universal life insurance is a type of life insurance that offers flexible premiums like a term life insurance policy, and lasts as long as a whole life policy. Think of it as a compromise between the two products. Like any traditional life insurance policy, a gul insurance policy will require an exam. Approved: You have been medically approved for the policy and can pay for it for coverage. The best thing about a guaranteed universal life policy is that your premiums can be level for a lifetime. Your death benefit can go up to ages 90, 95, 100, 105, 115 or even 121. You even get to choose the length of your premium payments. These policies aren't as affordable as a term life insurance policy;however, they are more affordable than a whole life insurance policy. Time for approval with a traditional gul insurance policy is going to be around 2 to 4 weeks. You are going to go through the same underwriting process as you would any type of traditional insurance product. The best thing is that working with an agent can usually help speed up the process. 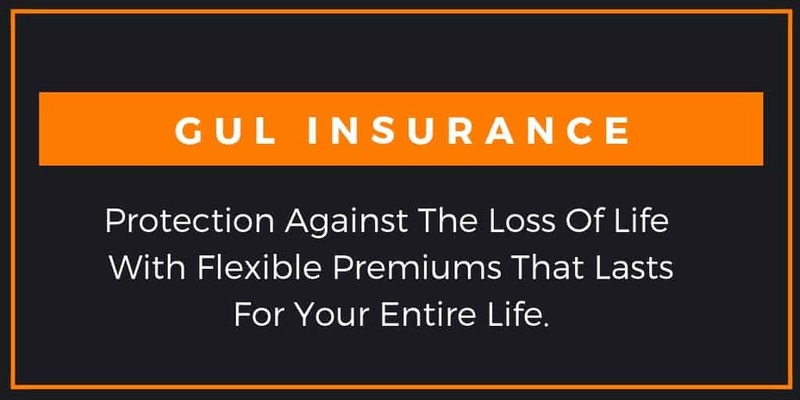 What Type Of GUL Insurance Quotes Do You Offer? ​Simply Insurance offers a wide variety of affordable guaranteed universal life quotes online. What Does Guaranteed Universal Life Insurance Cover? Like a traditional life insurance policy, a gul insurance policy covers the same thing and the payout is another form of a lump sum payment, once it's paid out to your beneficiary they can use it to pay for anything. Don't hold back, it is more affordable to buy guaranteed universal life insurance than you think. ​How Much Life Insurance Do You Need? So if you make $50,000 / year, a policy for $500,000 would be our suggestion. Just remember to buy life insurance that you can afford. When you are looking at any of our secondary guarantee universal quotes you can always start off with the lowest premium payment you can afford. There are two types of life insurance, Whole Life and Term life insurance. From our experience, Term life quotes will always be a bit more affordable than Whole life insurance. Can I get Guaranteed Universal life insurance online? If you are looking to shop for guaranteed universal life insurance online, then you have come to right place. We have made it easy to apply for life insurance online through some of the most technologically innovative companies in the nation. Our partners make buying gul insurance online incredibly easy and affordable. You won't find another company that will make your insurance coverage a priority. With our guaranteed universal life plans you can get covered fast and spend more time on other things you care about. Don't be shy, get life insurance rates today to get covered with our A rated Carriers through AM Best.